Here's the thing; I've always been fascinated by the moon. It's not a star, yet it's reflections from the sun really glows. On a full moon with clear skies, the light from the moon can be enough to read the paper. I'm always trying to get a glimpse of the full moon, hoping to take a good picture of it. This task is sometimes really hard, with all the clouds and the position of the moon and all. I was lucky this winter though, and got a fairly good shot of it (and posted it on the blog). Then, one fine evening, as I was actually shooting the flowers in the garden. 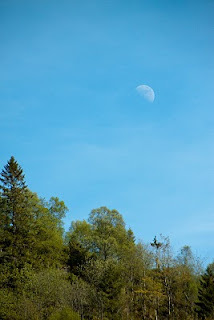 I looked up and saw the moon, resting just above the tree-line in the horizon. Now, wouldn't I've been a fool not to capture it?